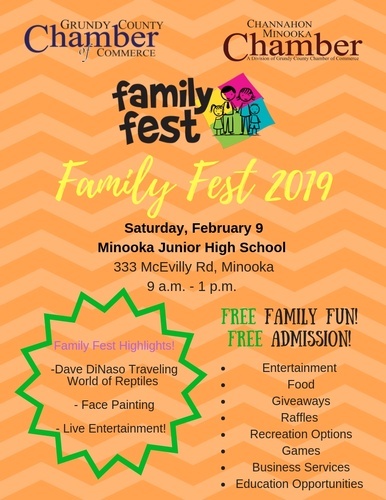 The Grundy County and Channahon Minooka Chambers of Commerce are gearing up for Family Fest 2019, a family-centered business expo showcasing the programs, products and services available throughout the area. The purpose of the event is to provide our members and other local businesses the opportunity to connect with residents, engage potential customers and leverage their business all while celebrating community. The event is presented free of charge and attracts nearly 1,500 people each year. We invite you to get in on the fun while promoting your business.